We are still picking tomatoes every day. There was a touch of frost the other night in a few spots of our yard but the tomatoes escaped unscathed. Today I need to roast a bunch and get them tucked away in the freezer to use as soup throughout the winter. 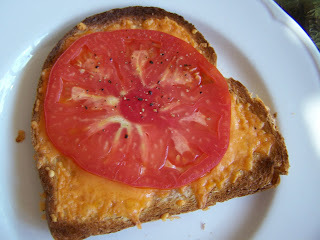 We had several pots of simple tomato soup last week but one of my all time favourite ways to eat tomatoes is like this. Bread topped with cheese (preferably old cheddar) and then toasted under the broiler. Add a large slice of tomato for the last minute or so to warm it up. A titch of salt, some pepper...delicious. Quite often, I think, simple really is best.